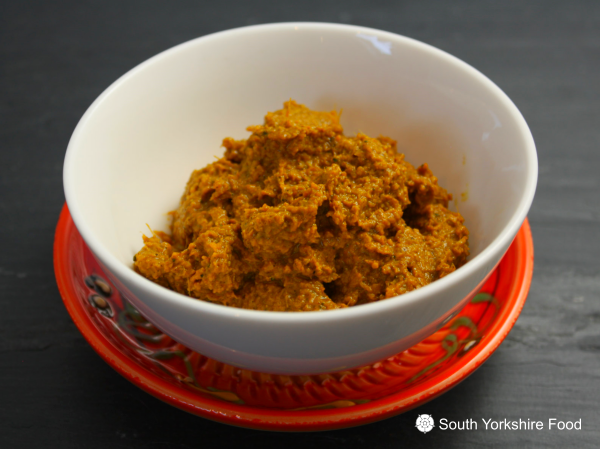 An exotic and fragrant curry paste that is used as the basis of the famous Thai Massaman Curry. Dry toast the fennel and coriander seeds, cardamom pods, mace, cloves, peppercorns and chilli flakes in a heavy pan and on a medium heat until they just start to colour and smell aromatic. Crush the cardamom pods and remove the seeds, and discard the pods. Add all the toasted spices into a spice grinder or a pestle and mortar, then grind/pound it all up until very fine. Peel the garlic, ginger, onion and lemongrass, then roughly chop and put them into a food processor. Next add the ground spice mixture, the turmeric, cinnamon, shrimp paste, fish sauce, coriander , lime zest and a couple tablespoons of vegetable oil. Blitz to a fine paste, pausing halfway to scrape down the sides, if needed. Add more oil if required. Use immediately for best results, but will keep for a couple of weeks in the refrigerator if put into a sealed glass jar.